Practice taking turns and basic conflict resolution on the playground. Oh, the playground . . . just the word conjures up images of lovely green spaces, children laughing, parents chatting, and everyone getting along peacefully. Sometimes, however, it can feel more like a war zone. The playground is a wonderful environment for helping children develop physical, cognitive, and social-emotional skills. Yet, the collective play space can also be a breeding ground for social conflict and interpersonal compromise for parents and children alike. Visit a playground on any given day, and you'll find caregivers cajoling over-tired and hysterical preschoolers into leaving their much-loved play dates; children throwing sand or fighting over a coveted toy; tense parents struggling between an impulse to shout and the need to model social composure, and misbehaving kids and grownups alike. Conflict does not need to be feared. Squabbles over possession of items or rules of a game are normal parts of childhood development. In fact, many developmental theorists suggest that conflict, and allowing a child mastery over it, are building blocks for successful intellectual and interpersonal development. Helping children understand the "hidden curriculum" of social norms can help them learn how to control their emotions and adapt their behavior to different situations. Let children know that there are rules for interacting with close friends and rules for interacting with people we've just met, "inside" voices and "outside" voices, and maybe even different rules for grownups and kids. Describe these social nuances as part of a larger social world around them. A great way to facilitate effective communication is to use empathetic listening and "I statements." Research tells us when a sentence starts with the word, "You", our brains automatically prepare us for fight or flight. Empathetic listening and I-statements help deflect defensiveness and keep the focus on resolution. The next time your child becomes angry with a sibling or peer, ask them to share their feelings using an I-statement. For example: "I feel angry when you push me on the slide." An older child is climbing to the top of a playground gym. A younger sibling is not allowed to follow. The battle cry is wailed, "But that's not fair!" It's actually fair, based on developmental differences, but younger children frequently struggle with this concept. Prepare children before going to the playground that different rules apply to different children and that you will strive for fairness—even when the outcome is not quid pro quo. An outing with children seems incomplete without someone begging, "But just 5 more minutes, please?" Develop a routine regarding playground comings and goings. 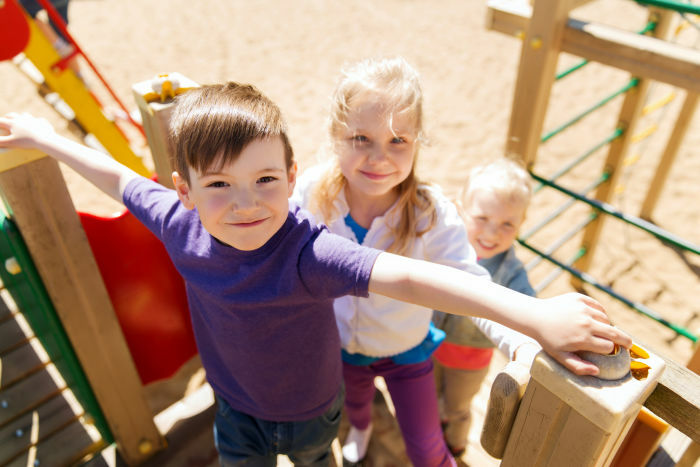 Providing 5, 2, and 1 minute notices for departure time can help children feel a sense of ownership about their experiences at the playground. At the 1 minute warning, suggest that your child find one more activity to complete his or her experience. Then, when it's time to go, "no" means we're out of time. And don't give in. Showing firm boundaries with behavior helps our children replicate strong boundaries with peers. When another child was aggressive, my son frequently sat in stunned silence, unsure of how to respond. I learned to create boundaries for him. If a child was failing to give him a turn on a swing, or alienating him socially, I would say loudly—so that nearby parents might hear, "Remember to use a big voice and tell the other children that it's important for you to get a turn, too. Everyone needs to share at the playground." Soon he was using similar language to set limits and negotiate conflict with other children. We've all seen it: the parents who ignore their children's misbehavior and target your child as the wrong-doer. Use the above strategies to set appropriate boundaries, communicate effectively, and manage your emotions to be a role model for your children. Politics on the playground mirror those in the adult world: not everyone will get along. But at the end of the day, be prepared to agree to disagree. Then, make the most of each moment, enjoy the sunshine, and smile! Visit us on Facebook and share your tips for navigating playground politics.